I’m fairly certain that nobody has walked away from a Bentayga purchase because Bentley didn’t offer a hybrid version, but if anyone was on the fence about things, there’s now a Bentley Bentayga Hybrid to soothe your guilt-ridden, gas-burning heart. Sending power to all four wheels via an electric motor and a turbocharged 3.0-liter V6 engine, the motor both acts as a generator and powers the car for an EV-Drive mode. Complete stats haven’t yet been announced, but if it’s similar to the Porsche Panamera 4 E-Hybrid’s combined 462 horsepower and 516 lb-ft of torque, it ain’t too shabby. Certain displays inside the car have been altered slightly to show its consumption and battery status, so you can monitor things in real-time. Battery recharge takes a claimed 2.5 hours. Bentley was very mum on other details, such as mileage and pricing, but did mention that the Bentayga Hybrid would be available to order “in selected markets” later on in 2018. Just like how people who buy Model Xes aren’t really concerned about paying for gas in real life, the people who buy the Bentayga Hybrid probably aren’t too bothered by gas prices, either. 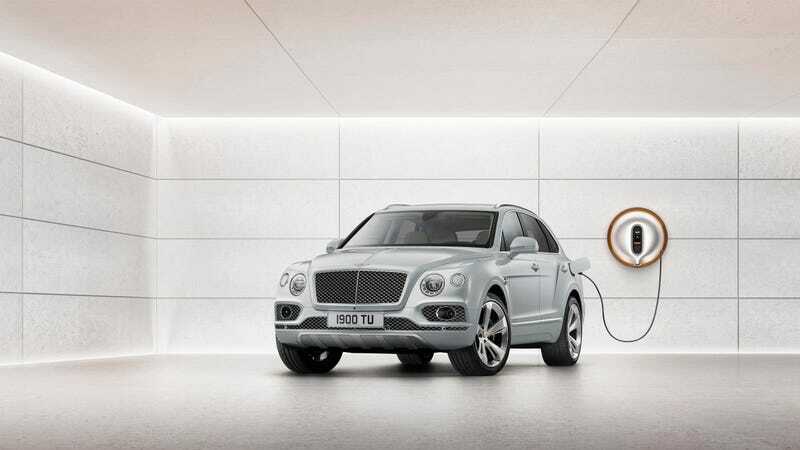 More than anything else, this car is evidence of Bentley’s intention of moving with the times and introducing more and more electrified options into its lineup to comply with future emissions regulations. Now, if Bentley started offering a hybrid W12 Bentayga... then you’d have my full attention.